In Living in the End Times, Slavoj Zizek defines the Soviet experience in terms of a marriage that should never have occurred, and suggests that there is something inherently flawed in the experience of revolution itself. The implicit assumption is that capitalism represents the end times. Despite his qualifications about revolution, Zizek is still opposed to contemporary capitalism as a global order that rejects utopia in the name of its “utopia of the market”. However, the apparent alternative of liberal multiculturalism is also criticised by Zizek. Multiculturalism has its own ideological contradictions such as the superior demand for toleration of different beliefs which is based on the biased standpoint of the neutral benevolent observer. The choice for minorities is still to adopt a standard of behaviour that is favoured by the dominant culture, and therefore true multiculturalism is a contradiction that cannot be resolved. But what are the values of this new universal? How can cross-cultural unity be established despite the plurality of beliefs? Zizek does not answer this question and instead argues that struggle in itself will somehow resolve this question. However, struggle can only be the practical result of a process of ideological and cultural transformation. This requires that we establish a common basis for unity and agreement. Significantly Zizek does not argue for a revolutionary alternative to cultural tensions, and instead actually assumes that communities are static formations that are based on actual mistrust and superficial ideological unity. This condition can have some historical truth, but it is not a permanent situation and the exploration of the development of a new universal would be useful. Zizek neglects this task. He knows what he is against, but he has more difficulty in explaining what he is for and how it can be realised. Zizek’s support for the notion of revolution is nostalgic and is based on what might have happened in the past but which is unlikely to happen today. Furthermore, his wariness about the effects of revolution suggest that his praise for the audacity of Lenin is about indicating the uniqueness of this individual, who is the personification of revolutionary determination. In contrast, the possibility of revolution in the present is not articulated. What is apparent to Zizek instead are the various forms of anger within capitalist society that do not become a dynamic of revolution. It is significant that Zizek prefers the Christian concept of love to the various secular approaches which, he suggests, have a totalitarian logic. How does Zizek’s support for the claims of religion in terms of the connection between the role of Christ and the ability to define love influence his political standpoint? The answer is that the Christian emphasis on duty as the basis for understanding love is similar to Che Guevara’s view that the tasks of the political take priority over personal love. “Perhaps there is no greater love than that of a revolutionary couple, where each of the two lovers is ready to abandon the other at any moment should the revolution demand it,” says Zizek. However, for Guevara the role of love was combined with the hatred of the enemy and so the crucial question is how is it possible to combine these emotional opposites? Zizek is not able to answer this question in terms of the views and actions of revolutionaries. Instead he is only able to uphold a religious approach in terms of how Christ poses the relation of love and hatred. Consequently, the very atheism of the standpoint of the revolutionaries is a problem because they will not be able to establish the relation of hatred to love. “With regards to the social order, this means that the authentic Christian apocalyptic tradition rejects the wisdom according to which some kind of hierarchical order is our fate, such that any attempt to challenge it and create an alternative egalitarian order will necessarily end in destructive horror… an unconditional egalitarian love for the Neighbour can serve as the foundation for a new Order. For Zizek, the paradox of the atheist and revolutionary approach to love is that it is only able to establish a functional and meaningful perspective in the relations between individuals, in the sense of the promotion of duty as the basis of love. However, it has not been possible to sustain this concept of love because of the relation of hatred to the class struggle and the necessity to promote terror against the class enemy. This is why all forms of revolutionary regime have led to the justification of terror, he claims. How, then, can a revolutionary regime avoid the descent into terror? Zizek’s answer is provided by the promotion of alternative ideological values and the understanding that hatred of the class enemy is to be replaced by love of the neighbour. He is accepting that hatred is a more powerful ideological and psychological impulse than love and therefore it is entirely possible for a revolution to regress into support for terror. The ultimate political logic of his standpoint is that if the revolutionary regime cannot provide a guarantee of the realisation of Christian love it would be preferable to sustain the love of a Christian community within capitalism. In an unconvincing manner, Zizek tries to also argue that terror based on love is possible, but this only undermines the consistency of his argument. Ultimately he accepts that the political character of a community of believers is more credible than a revolutionary regime that does not understand the importance and purpose of love. This is why his objections to communism are still stronger than his arguments for an alternative society. The criticism being made is not that Marxism should not learn from other world views about how to sustain and develop a society attempting to realise communism. However, can we also argue that the problems of regression and terror were due to the lack of Christian love within society? Is it not more relevant to establish the reasons that led to the formation of the rule of bureaucratic elites that took hold due to the rejection of a revolutionary approach to the practical questions concerning how to develop society. Hence, what is called for is the sophisticated development of a Marxist standpoint in order to understand what has gone wrong rather than the effective rejection of Marxism in the name of the importance of religious values. Zizek is unable to establish the political basis for a historical alternative to capitalism in terms of struggle against the system, and instead seems to prefer an alternative represented by a community of believers that acts within the system. Yet he is very critical of the false religion or flawed beliefs that sustain capitalism. Capitalism is based on false ideological beliefs and the assumption is that the falsity of these beliefs cannot be overcome within the limitations of the system. However, we continue to act in accordance with the imperatives of capitalism despite the fact that we know them to be false and against the interests of humanity, Zizek argues. The logical conclusion is that the only basis to overcome the limitations of false beliefs is to struggle for a different economic and political system because false beliefs cannot be overcome within capitalism. However, Zizek does not arrive at this conclusion because of the tensions within his standpoint. He is against capitalism because of its ideological falsity and destructive practices but he is not for revolution, which can be destructive in a different manner. Instead of an attempt to drawing the contours of a contemporary and authentic revolutionary process, Zizek is content to generalise from empirical reality in an uncritical manner. For example, he argues that despite the absence of democracy and genuine trade unions in China, the political rule of the Communist Party has promoted a combination of prosperity and authoritarian rule. He also maintains that the regime in Haiti led by Aristide was what a modern dictatorship of the proletariat would be like in terms of its support for forms of participatory democracy and the advancement of important economic measures to improve the standard of living. The problem with this standpoint is not that the empirical analysis is necessarily inaccurate, but rather that Zizek accommodates to what exists and cannot envisage an international alternative to the regime of global capitalism. Instead he is arguing for an alternative within the constraints of global capitalism. He advocates a strong state that can regulate the market rather than envisage a society that attempts to transcend the market and establish new forms of economic activity. The implicit assumption is that capitalism represents the end times, but that different types of capitalism can be envisaged and that the state interventionist standpoint of the Chinese Communist party is preferable to the uncritical acceptance of the market. Hence Zizek is opposed to the market but he is not opposed to capitalism if it can be combined with reforms and the prospect to increase the standard of living. This is why his support for the Aristide regime in Haiti is not because it has really introduced the dictatorship of the proletariat but rather that it has introduced meaningful reforms that have improved the conditions of the people. What this shows is that Zizek suggests that the actions of a benevolent elite is all that is historically possible, and he is actually sceptical about the possibility of the self-emancipation of humanity in terms of a revolutionary transformation. Consequently, he is not calling for communism because this would represent the necessity and actuality of mass action that is popular and democratic. Instead socialism and communism are reduced to what is made possible by the action of a party within capitalism. Zizek offers a thoughtful analysis of the increasing inability of the USA to sustain an imperial role but his argument is based on a political emphasis of the increasing instability of international relations and the ideological decline of the attraction of the American dream. He only briefly refers to the importance of the American economy being sustained by other nations and he concludes that the dominant American role in international relations can be assumed by a Europe that does not know its own strength. This is the most explicit expression of the standpoint that an elite is eternal and that it is not possible to have a society without the hierarchical stability of the relationship between an elite and the mass of the people. Consequently, the central questions are how the elite rules, does it rule in a democratic manner in terms of consultation with the people, or does it ignore the aspirations of the people? The assumption is that a society without elites would be unworkable and therefore the question of the renewal of democracy is about re-establishing the political relationship between the elites and the people. This perspective is based on the conception of how we improve capitalism in economic and political terms, and revolutionary transformation is effectively considered to be abstract, utopian and self-destructive. Instead we require a democratic Europe that can act as a genuine alternative to the declining hegemony of the USA. At present Europe lacks a programme of what it represents and how this differs from the USA. If it had such a vision and political renewal it could represent a pole of attraction that would represent being a genuine rival to the USA. Zizek seems unaware that the objective content of his standpoint is to support a type of progressive European imperialism against a reactionary USA imperialism. Zizek argues that the worsening ecological crisis may represent the negative universal history that is undermining the very conditions of human existence. Those who contend that the ecological situation is independent of our political orientation and belief in capitalism or socialism are upholding the deception that denies the actual historical relation of global capitalism to the ecological condition of the world, he says. The fact that all the various ecological summits have been failures is an expression of the fact that the various elites put the interests of global capitalism before the issue of the survival of the planet. The very apocalyptic character of the threat to the planet caused by the ecological situation is the logical outcome of capitalism and its incessant requirements of expansion. This is Zizek at his most radical, and the perspective is that only the revolutionary replacement of capitalism will be sufficient if the possibility of the ecological situation is to be resolved. 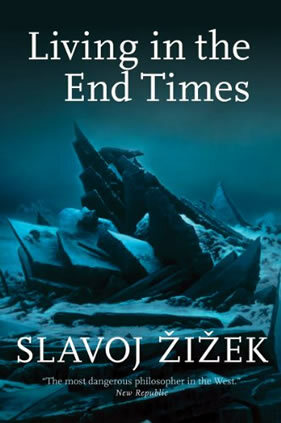 Zizek is saying that capitalism could be the end time of the world in the most negative and tragic manner, and therefore he is suggesting that the end times being promoted by capitalism require struggle for a historical alternative. Now he is no longer talking about sustaining capitalism because of worries about the post-revolutionary situation. Instead the very survival of the planet dictates what are revolutionary alternatives. If Zizek is prepared to make the serious argument that the process of capital accumulation is primarily responsible for the ecological crisis, he has the obligation to outline what he would consider to be the historical alternative. He is adamant that the various approaches based on reform of capitalism will not work. However he will not argue for communism as the answer to the contradictions of the end times. It remains at the level of theory of what is desirable and yet is apparently not justified in practical terms. Hence, his communism remains as a Platonic ideal that is an ideal to be expressed in terms of theoretical principles, and yet is somehow not attainable because of the lack of popular support and credibility in the aftermath of Stalinism. This comment represents the climax of the ideological crisis of the standpoint of Zizek. It has been a constant feature of all his past work that revolutionary terror has been historically justified and is not generally responsible for the limitations of Stalinism. The very fact that he allows for this connection is an expression of his scepticism about the historical necessity of revolution. He is accepting that the very logic of revolution can be to establish a connection between mass struggle and the creation of a party-state. What seems to be an increasing willingness to oppose Stalinism is connected to the discrediting of revolution, because, in his view, revolution can only result in Stalinism, or even the tragedy of the horrors of Cambodia. Zizek’s inability to articulate an alternative to Stalinism means that he knows his standpoint is vulnerable to the criticism about the equation of mass terror with totalitarianism. However, he is still opposed to capitalism and is critical of all those that dilute the standpoint of communism in order to make themselves acceptable to liberal opinion. This only increases the contradiction between his radical critique of capitalism and his wariness about the uncertain promise of the future as communism. Zizek argues that the dilemma of democracy concerns the contradiction between the stance that people are rational and good and that people can be corrupted by power. How can this contradiction be resolved? He is aware that non-liberal democratic regimes want to impose their type of society in terms of the role of antagonism and the need to oppose enemies, and therefore it appears that liberal democracy is the most effective expression of compromise. However, liberal democracy is constituted in such a manner that it restricts the possibility to realise the egalitarian and democratic impulse within society. He argues for communism in terms of a critique of the film Avatar. The story is about how an employee of a mining company from earth helps the people of a planet oppose the attempt of the company to exploit their resources. Zizek argues that this represents the typical chauvinist fantasy that only the people from earth can save the planet from ecological destruction, and the people of the planet have a passive role in the process of saving the planet. This is a problematical aspect of the film but it could also be argued that the saviour from earth is expressing an internationalist concern for the people of the planet, and so his actions should be supported rather than criticised. Zizek may be able to show that the hierarchy on the planet does undermine the prospect that it could become a utopian paradise, but this does not mean that he is able to articulate the alternative of utopia on earth. The cultural limitations of Hollywood do not automatically mean that struggles on earth can express a dynamic of communism. In contrast, all that he has proved is that the various social antagonisms represent the basis for constant class struggle. But he is not able to outline how these struggles can be resolved in terms of the establishment of an emancipatory society that is both stable and democratic. Furthermore, Zizek is unable to argue that the actions of a subject can resolve contradictions in a progressive manner because the subject may act in a self-destructive manner. For him, there is no a dialectic of history that can ensure that the actions of a subject, however important can ensure a process of movement towards communism. For example, Gorbachev was trying to reform the system in the USSR but the unintended consequence of his actions was to bring about its downfall, and therefore a process of movement from lower to higher did not result. The outcome was not the development of an improved society that could make progress towards communism. Instead human fallibility has shown that repression towards capitalism is entirely possible, and so there is no logic of history that can represent movement towards communism. It is interesting that Zizek does not try and establish which course of action is preferable, and crucially the revolutionary approach is only one amongst other options. He has outlined the rationalisation that making some form of peace with capitalism may be necessary and practical in relation to the given balance of class forces. He suggests that it may be entirely principled to adapt to the existing society because the alternative has become a practical impossibility. This stance is not a surprise. Zizek’s pragmatism is entirely consistent with his perspective that the revolutionary process may be inherently flawed by violence and surplus energy. In other words, he is arguing that the struggle for reforms may be as principled as the struggle for revolution. This seems to be implicit criticism of the revolutionary left, and that the radical alternative is to accept that God has left humans to their own devices. Hence, the situation is that of total freedom which implies an ontological condition of contingency replaces that of historical necessity. Humans are close to the end times in terms of the ecological situation, but despite this condition we still have autonomy to define our future. The problem is that the alternative to capitalism is undermined by the problem of the passive subject, or the Beautiful Soul, and the destructive character of terror. On the other hand, global capitalism is historically limited by its ceaseless quest for expansion, social division, ecological problems and poverty. Consequently, we are in a historical impasse and the only principled answer may be the struggle for reforms. If we are to argue effectively and convincingly for communism we have to provide an alternative to the reservations of Zizek. For example, we have to show that the means can be compatible with the end and that progress towards communism is possible without resort to terror and the repression of democracy. Furthermore, it is necessary to outline how the struggle for reforms is not the preferred option and instead reforms are only substantial and truly principled when connected to the struggle for a future society. Given the many theoretical contradictions of Zizek how can we explain his growing popularity? Zizek is a very radical writer and is capable of indicating important ideological limitations of capitalism in the spheres of culture and politics. He is able to indicate that global capitalism is flawed and is not the future for humanity. He is able to show why we should continue to protest against global capitalism and its economic and political expression. In this context he articulates a popular mood of opposition to capitalism, but one which also represents scepticism about the communist alternative in the aftermath of the effective demise of Stalinism. Zizek’s ideas have, therefore, come closer to those of his readership. This will make him increasingly popular in the short-term. However, the intensity of the crisis of capitalism will continue to create arguments for the communist alternative. Zizek has an important challenge in the future. Will he be able to overcome continued accommodation to the scepticism of his readership and establish new and more imaginative arguments for communism? Or will he be content to remain a critic of capitalism? Zizek's argument about survival = the new Utopia is a good one.